Tax Day has come and gone. And while I was enjoying this hunk of change I just got back from my tax returns, I suddenly felt a rare pang of guilt. Who was I to enjoy all of this money, when there were others in the world who couldn’t? I don’t make my disdain for charities a secret. True, you get some tax benefits from doing it, but you still save more by not giving in the first place. 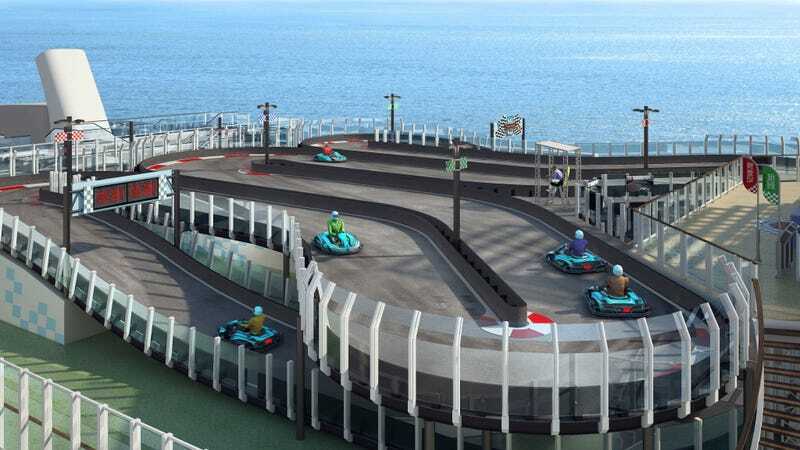 But since so many of you (one) called me out on not doing something for the less-than-fortunate, I caved and pulled a plan together: I’m going to put a two-story Ferrari-branded go-karting track on the top deck of a Norwegian Cruise Line cruise ship for the needy. Overseeing a partnership with Norwegian Cruise Line and Scuderia Ferrari Watches, I green-lighted the newest ship, called the Norwegian Joy. It’ll be a 3,850-passenger cruise ship purpose-built for the Chinese market because the poorest people in the world are the cruise-going types in China. They need this. Up to 10 drivers at a time will have the chance to duke it out in electric go-karts while cruising across the ocean blue—how freaking sweet is that? There will be photographers at the finish line to document the occasion so the charity cases will be able to tell others at home how generous I am. What’s that? Free? Wait—you didn’t think I was giving away the go-kart runs for free, did you? Oh, you’re adorable. But also not completely wrong. See, go-kart rides are only free to guests staying in the Haven and Concierge class—the suites and staterooms. Everyone else with cheap tickets has to pay for the karting. No, nobody gets a discounted ticket for a cruise aboard the Norwegian Joy. What are you, insane? I’m a businesswoman first and a humanitarian second. I thought that much was abundantly clear. Get it through your head: the cruise ship go-karting will only be free to the guests paying for the most expensive rooms. Understand how much better off they’ll be with this. Man, it just feels so good to help. Because—and this is a lesson we could all benefit from—you can’t take it with you.